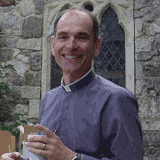 My name is Peter Salisbury, the current vicar of Lymington. I am married to Sarah, we have two grown-up daughters and have been at St.Thomas’ since October 2005. My hope for our church is that we should be known for living the mission of Jesus: prayerful, positive, caring and growing. There has been a church on the site for more than 800 years and we’re very glad to have been a part of the history of Lymington. But St.Thomas’ is about so much more than the past. We are the parish church of Lymington, and as such, we believe our main purpose is to serve the town in whatever way we can to authenticate the gospel of Christ. We run weekly services, both on Sunday and during the week, from the traditional to more contemporary, we host opportunities for people to meet together and support them at pivotal points in the lives. With the biggest concert space in Lymington, we host concerts throughout the year and, with our Church Hall and kitchen, most events can be catered for. But that’s just scratching the surface of St.Thomas’. Take a look around the website, and if you have any questions, don’t hesitate to contact us.